MacDonald Bright Jumbo, Maize Molecular Breeder at International Maize and Wheat Improvement Centre (CIMMYT) in Nairobi , introduces himself and his work in the Africa RISING program. It is one of a series of portraits of key people in Africa RISING. I am a Malawian by nationality and I am currently a Molecular Breeder for the Global Maize Program at CIMMYT. Previously, I was working as a plant breeder (cereals – sorghum and pearl millet) at ICRISAT and before that I worked for the Department of Agricultural Research in Malawi. I have an MSc degree in plant breeding and genetics from North Dakota State University, USA and a PhD in plant breeding and genetics from University of Delaware, USA. CIMMYT is one of implementing partners in the Africa RISING program and so I am the theme leader for the Maize Lethal Necrosis (MLN) disease research work being done by Africa RISING in Tanzania. Of course this work under Africa RISING is part of broader efforts within the region to address emerging maize disease epidemic in east Africa. I am also involved in the USAID Tanzania mission funded project Enhancing partnership among Africa RISING, NAFAKA and TUBORESHE CHAKULA (TUBOCHA) Programs for fast-tracking delivery and scaling of agricultural technologies in Tanzania. MLN has emerged as a serious threat to maize production in region. The disease was first reported in Kenya in 2011 but has since spread to Tanzania and Uganda, with new reports of its presence in Rwanda, Burundi, Ethiopia and South Sudan. MLN is caused by mixed infection of maize plants by combination of Maize chlorotic mottle virus (MCMV, genus Machlomovirus) and potyviruses. In Kenya and other countries, most frequently it is Sugarcane mosaic virus (SCMV) in synergism with MCMV causing MLN. Results from initial screening of large volume of pre-commercial and commercial maize varieties from the region have shown that most of the varieties are highly susceptible but some maize inbred lines and hybrids have shown moderate tolerance. With support from Africa RISING, CIMMYT is evaluating maize hybrids in Tanzania to select varieties with tolerance to MLN and good adaptation in Babati, Tanzania. In addition, CIMMYT evaluates Quality Protein Maize (QPM) and drought tolerant maize for yield and agronomic performance in Kongwa/ Kiteto districts in Tanzania. QPM has enhanced content of lysine and tryptophan, important for increased protein in grain. 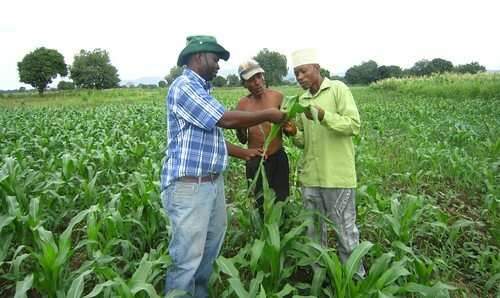 CIMMYT is working on this effort in Kongwa and Kiteto districts in Tanzania. QPM will contribute significantly to nutritional needs by families, especially young children and mothers. What are your plans for Africa RISING (i.e. your next bit of work)? 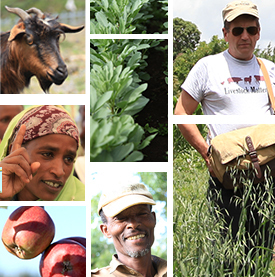 Together with my team, we intend to focus on identifying MLN tolerant varieties for fast tract release in Tanzania. We will also seek to identify QPM varieties with good characteristics that meet consumer preference. The goal here is to ensure that through Africa RISING, MLN tolerant maize varieties are released and available for farmers use. We will also be working on releasing drought tolerant maize with high nutrition value in the marginal (stress) areas like Kongwa and Kiteto districts as a means of giving smallholder farmers crop varieties that are responsive to their ecologies. What do you find unique about Africa RISING? For me it is the multi-disciplinary work going on within the program. Africa RISING has brought together over 100 scientists from diverse disciplines and institutions to work together and develop integrated solutions for small holder farmers. This is a unique approach that ensures partners synergize their research efforts while also ensuring that resources are not wasted in duplications. From the technical point, evaluation of maize hybrids/varieties for MLN resistance under natural disease infestation is quite a big challenge, because the there is usually high variability of disease pressure within each environment and across environments for some seasons. This means to get reliable data we need testing several times across several seasons. However, for Africa RISING, the concept has been to select top performing materials from each season and move on with those materials in next season which is a challenge for cases such as MLN. Besides this, it also becomes a challenge to have publishable data if we only collect data from one season under such conditions. So the solution is to have repeated tests for several seasons, say three seasons. What are some of the main achievements by your research team? We have been successful in identifying QPM varieties that are stress resilient and are already in national performance trials for variety release. Two QPM hybrids have now just been approved for release in Tanzania. What do you most want to accomplish in your work with Africa RISING? I will be fulfilled when we finally have MLN tolerant varieties released in Tanzania, be made available and accessible to farmers. That will be a big contribution to helping farmers through the sustainable intensification initiative under small holder farming. What gives you hope looking at a possible second phase for Africa RISING? The first phase of Africa RISING focused much on research, and we have made good progress with identifying high performing crop varieties and refining certain technologies. In the second phase, we should figure out the best scaling methodologies to ensure the varieties and technologies are with the farmers while continuing research with new crop varieties or technologies to make more improvements. 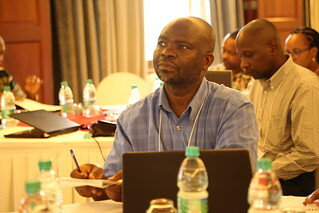 Tags: CIMMYT, interview, MLN, RISING voices, Scaling, Tanzania. Bookmark the permalink.